As an Artist are you unhappy with the results of your social media efforts? There could be a simple answer to this issue in that you may be posting your messages at the wrong time of day! 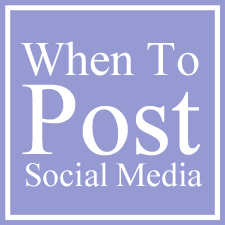 Facebook – The best time of day to post on Facebook is in the afternoon from 1:00 PM to 4:30 PM. Also, according to several studies they believed that a Wednesday is the best day of the week to post, as this day generates the maximum amount of traffic and your chances of being read by a greater amount of people increases on this day. Twitter – On Twitter the best time to post is also in the afternoon from 1:00 PM to 4:00 PM on weekdays, rather than on weekend days. Linkedin – Due to the nature of this social media platform, that being for working professionals, it indicates that from 7:30 AM to 9:00 AM (before work) and late in the day 4:30 PM to 5:30 PM will be the best periods during the day to post your messages. People have the time to get caught up on their networks at these times. Google Plus – Anytime from 9:30 AM to 11:30 AM is the greatest time to post on Google Plus in order to reach the maximum audience for your message. Pinterest – There are some studies that will show that afternoons are a good time to post on Pinterest, but the absolute best time of the day is to post between 7:00 PM to 12:00 Midnight. Also, weekends are best days to post, as viewers have more time to devote to this platform then. Remember: Pinterest users view this site in terms of a hobby and that is why nights and weekends create the maximum reach for any marketer. As an aside, weekends are the best time to have your message shared by followers within your networks. The explanation for this is that people are more relaxed, they have the time to read your posts and the time along with the inclination to share that information with others who they feel would also be interested in that information. In any social media strategy, stay on message with related content in your posts that your target audience will find interesting and helpful. Post messages and content on these days and times with your various networks and your social media promotions will become immediately more effective and successful. Good luck!